ChromoTek Nano-Traps like GFP-Trap, RFP-Trap, mNeonGreen-Trap, Myc-Trap, MBP-Trap, or GST-Trap, etc. consist of immobilized alpaca nanobodies. These are the ideal affinity reagents for immunoprecipitation followed by on-bead digestion for subsequent analysis by mass spectrometry, because they have high affinity and small size. Why is this the better protocol for hyphenated IP/ MS? On-bead digestion of protein:nanobody-complexes from immunoprecipitation results in a low single digit number of peptides from the capturing nanobody. This is because of its small size (14 kDa) and low number of accessible lysine residues. 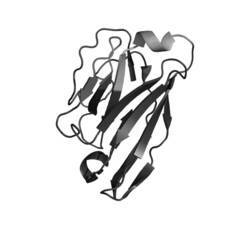 For example, on-bead digestion of GFP-fusion proteins bound to GFP-Trap gains just 4 nanobody peptides! Conventional antibodies, i.e. IgGs, are ten times larger than nanobodies and have more lysine residues. Hence, their tryptic digestion results in an increased number of antibody peptides, which potentially interfere during MS analysis. That’s why so many mass spec laboratories like ChromoTek Nano-Traps for MS analysis of Co-IP results. The protocol can also be used with all ChromoTek Nano-Traps. Interested in a free test sample? Hubner, N.C., Bird, A.W., Cox, J., Splettstoesser, B., Bandilla, P., Poser, I., Hyman, A., Mann, M. (2010). Quantitative proteomics combined with BAC TransgeneOmics reveals in vivo protein interactions. Journal of Cell Biology 189(4), 739-754.